Phuket Autogate is a Phuket based company, importing, distributing and servicing a range of gate and door automation equipment, gate accessories, gate hardware and etc. With years of experience, we are expertised in automatic gate systems and security access control solutions especially in all about PAT's automatic gates. 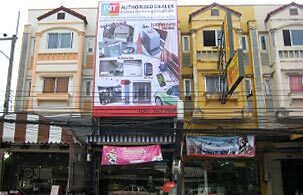 Phuket Autogate is an importer, a distributor and an installer for every type of automatic gate system. PAT outdoor designed for outdoor using especially. Materials are more resistant to sunlight, rain and variations in temperature. PAT semi-outdoor possible to use outdoor as well as outdoor. PAT indoor suitable for indoor use only. PAT SlidingGate sliding gate operator, gate operator: DC or AC motor; build in electric board, with mechanical or magnetic limit switch, oil bath with magnetic switch, imported products from Italy. PAT AutoDoor automatic sliding Glass door system components. PAT SwingGate with AC and DC motor, gate openers, swing gate accessories, hydraulic gate openers imported from Italy. Besides, installation and after sale technical support are also available.